Road: Andy Schleck (Team Saxo Bank) who took over the lead in the Tour de France after a fantastic run together with the worst rival Alberto Contador (Astana) on Tuesday received today on the tenth stage a calm first day in yellow. Instead, those who joined in today’s breakout fight for victory at the French national day. The strongest was Sergio Paulinho (Team Radioshack). Andy Schleck (Team Saxo Bank) who took over the lead in the Tour de France after a fantastic run together with the worst rival Alberto Contador (Astana) on Tuesday received today on the tenth stage a calm first day in yellow. Instead, those who joined in today’s breakout fight for victory at the French national day. The strongest was Sergio Paulinho (Team Radioshack). Sergio Paulinho swung in to the finish in Gap together with Vasili Kiryienka (Caisse d’Epargne) and the Portuguese was the hotter of the two. He pulled on a long spurt of White Russian frantically struggling on wheels. Once the finish line was only one bike length from Sergio Paulinhos front wheel put Vasili Kiryienka out his bike and challenged. It was tight. It was a victory with minimum margin of Sergio Paulinho. Tätduon was part of the group as the main peloton dropped off after just over four mile cycling. Tight group consisted of Sergio Paulihno, Vasili Kiriyenka, Mario Aerts (Omega Pharma-Lotto), Dries Devenyns (Quick Step), Pierre Rolland (Bbox Bouygues Telecom) and Maxime Bouet (AG2R La Mondiale). I knew I had to attack to get away from the Group and I was actually pretty good. 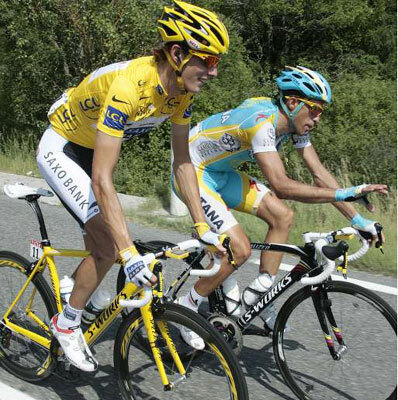 I was a little bit better than Kiryienka and waited until the last moment before I made my move, “says Sergio Paulihno. Mark Cavendish (Team HTC-Columbia) was the fastest in the peloton who finally became distanced by just over 14 minutes by Sergio Paulihno.